In an open letter, Gene S. Ryan cites concerns over "conflicts of interest" with Baltimore City State's Attorney Marilyn Mosby. But Mosby comes from a long line of police. 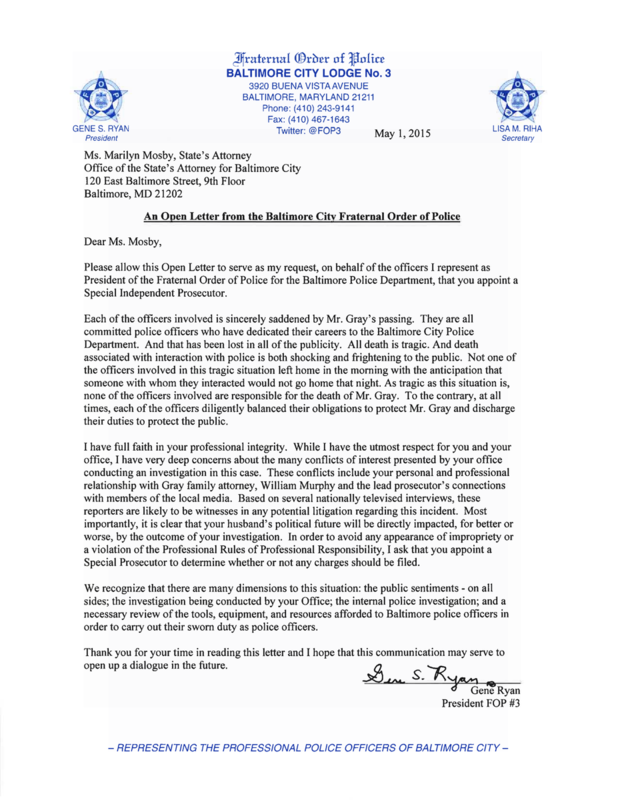 Even before Baltimore City State's Attorney Marilyn Mosby had finished reading the charges brought against six Baltimore police officers in the death of Freddie Gray, the city's police union had issued a letter calling on her to step down from the investigation. In an open letter, Baltimore police union chief Gene S. Ryan called on the state's attorney to appoint a special independent prosecutor. "I have full faith in your professional integrity," reads the Baltimore City Fraternal Order of Police Lodge 3 letter, which was posted online at the same time Mosby began her press conference Friday. "While I have the utmost respect for you and your office, I have very deep concerns about the many conflicts of interest presented by your office conducting an investigation in this case." Baltimore's police union chief previously referred to protesters as a "lynch mob," and said the union's support for the officers under investigation "will not waver for any reason." Ryan's letter cites Mosby's personal and professional ties to people involved with the Freddie Gray case. William H. "Billy" Murphy Jr., the attorney representing the Gray family, gave $5,000 to Mosby's campaign, according to The Baltimore Sun. Her husband, Nick Mosby, is a member of the Baltimore City Council. "She was born for this moment," Nick Mosby told CNN on Thursday night. Yet Mosby also comes from a long line of police officers—a fact that she mentioned in calls for calm during Friday's press conference. Her mother, father, grandfather, and several uncles are or were law-enforcement officers. The police union's letter neglects to mention this fact. "I know that the majority of police officers are really hard-working officers who are risking their lives day in and day out, but those really bad ones who go rogue do a disservice to the officers who are risking their lives and taking time away from their families," she told Baltimore Magazine in January, just after she was elected as the city's chief prosecutor. Ryan previously referred to protesters as a "lynch mob," and said that the union's support for the officers under investigation "will not waver for any reason." It is extremely rare for police officers to face charges over shootings and other deaths. An investigation by The Washington Post found that just 54 officers were charged in thousands of shooting deaths since 2005.